Map of Ticondera; the area of this chapter is highlighted in green. 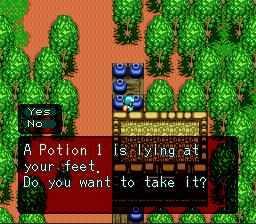 Potion: talk to an old woman in the village. Opal: in the north-east corner of the village, in an area that seems locked between the house of healing and the outer walls. 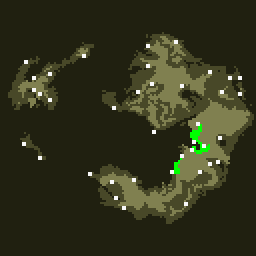 You can leave the castle and town by heading to the south. You are still too weak to get far away. Fight one or two combats, then get back in town and rest at the inn; repeat until you're ready. Check the table below to see the minimum requirements for your character. Weapons: Valsu should sell at once the two opals to purchase the best staff available; Olvan, Kamil, Wilme and Lux can rely on their strength, but better swords can help indeed; Esuna and Lejes can rely on their offensive spells. Healing: four characters can learn healing spells; Lejes can only learn HP-catcher, but he will also need some potions; Wilme and Lux have to get half a dozen potions; remember that Potions are also often dropped by enemies near Lemele castle. Armor: purchase the best armor available for every character; Wilme and Lux need no armor. The Item shop in this town is the only one that sells Bottles of Power in the first two chapters, so you might consider purchasing a few. Three are necessary to complete this chapter: against the two bosses and against a Trick, that is a trapped chest. You should better buy get seven-eight of each item, except jewels and potions: jewels are just money, potions-1 can be dropped by enemies, potions-2 are unnecessary now. Trivia: the Hermit monsters are clearly not human. They have insect-like appearance but, unlike insects, they have eight limbs: they are likely giant ticks. 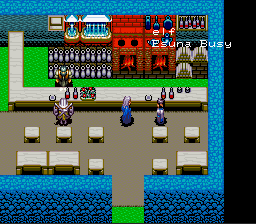 Rablesk is one of the candidate hometowns of Esuna, the elf girl. As you enter Rablesk, you will discover from the inhabitants there that Gate of Earth is closed, preventing citizens from traveling. As mentioned by the citizens, you will need to obtain the Key of Earth from the Castle of Aran, and use it to unlock the gate. 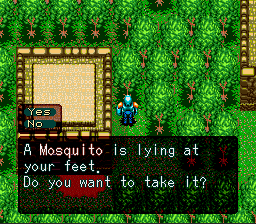 Mosquito: after defeating Romus, search near the south-west house, where the old man used to be. 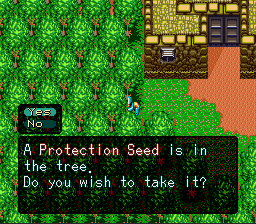 Again, the Item shop in this town is the only one that sells Bottles of Protection in the first two chapters, so buy 7-8 now. 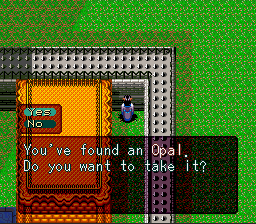 Floor 2: potion 1, opal. The castle of Aran is to the east of Rablesk. There are two monsters in the castle; the Chimera, and the statue, the former being a more dangerous spellcaster. To survive the enemies in the castle, you should be at least level 5 (although defeating Romus on the first attempt requires being level 10. In the basement, accessible by looping around the first floor, there are two items. The south-east corner has a Topaz, while the north-east has a Psyte sword. From the first floor, you will need to head straight north to reach the third floor. Once there, you can head south and loop to the west to collect two items (a power seed and a potion) or to the right for the fourth floor. The fourth floor has two chests as well. The north-east chest has a potion, and the central chest (accessibly from the south-west of its room) has an opal. To reach Romus, head to the south-west corner of the fourth floor and go north. Talk him to fight. As in any boss fight in this game, start by drinking a Bottle of Protection, followed by a Bottle of Power. After this, you can start attacking. Romus has two attacks; he will either shoot lightning at you or use a health draining attack. Your basic attack might not inflict much damage. If this is the case, try using magical attacks. If Romus defeats you, head to the southwest corner of Rablesk, through the path of trees and speak with the two people there. You will obtain the Whistle, which can instantly defeat Romus. When the battle is over, you will receive 240 Gold and 528 experience. You will also find the Key of Earth and the castle will no longer be infested. Room after the boss: magic herb 1, bottle of fire. The Cave of Earth is located south-west of Rablesk. The enemies in this cave are undead, and much more dangerous than those found in Castle of Aran. With the Key of Earth, you can unlock the gate that was previously blocking the path. On the first branch, you can head right to collect A. Seed and Antidote. Head left to continue, but avoid the following chest since it is an extremely dangerous Trick. If you lose to this Trick, it will be gone, but if you manage to defeat it, it may drop a Saphr, so you may want to come back for it later. 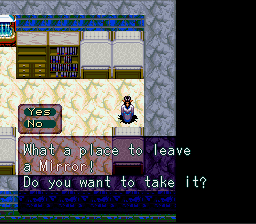 Be sure that you're able to defeat it on your first attempt, though, and bring a Mirror! Within the cave, you will encounter Pison, a bounty hunter hired by one of the rivals. The path behind Pison contains a B. Fire and a Magical herb. Continue to the end of the tunnel and head south-west to reach Bonro. Follow the same tactic as Romus: increase your defense and attack with two bottles, then use your most powerful attack. Since Pison is much weaker than Romus (and only has a single whip attack), you should have no problem defeating him to get 120 Gold and 264 experience.